In the United States, about 86% of women will have a baby at some point (1), and about 32% of those women will deliver by Cesarean Section (or C-section) (2). 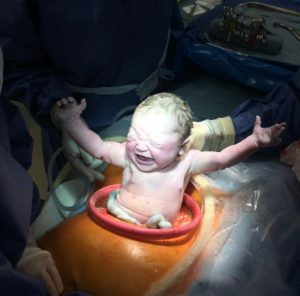 So, odds are that at some point you will work with a client who has had a C-section (even if it was several years ago). Therefore, it is important to understand what the body goes through during this procedure, along with what you can do to best support your client’s recovery — even years later. In this first post of a 2-part series, we’ll help you understand what a C-section is, why a woman might need one, how the procedure is performed, and what the typical post-surgical guidance (or lack thereof) is. Then, in part 2, we’ll talk more in detail about how the core tissues change during a C-section and provide some techniques you can use with clients to begin their healing process. A C-section is major abdominal surgery. The woman having the procedure will be anesthetized, usually from her waist down so that she can remain awake during the procedure (as opposed to general anesthesia, during which she would be asleep). The doctor most often makes a horizontal (or transverse) incision at the bikini line, cutting through skin and fat, moving muscle and fascia, and then cutting into the uterus to remove the baby and placenta. Moving abdominal muscle also alters the pelvic floor musculature since the abdominal and pelvic floor tissues are so intricately connected. Many people think that because there is no vaginal delivery, there is less stress to the pelvic floor muscles during a C-section. However, in many cases, the exact opposite is true. Once the uterus is cleaned out, then the stitching of several layers of tissue begins. If you can tolerate the graphic nature of a video documenting an actual C-section, watch this C-Section Video, as it will bring to life the actual scope of the surgery and give you a greater appreciation of what your clients’ bodies have gone through (or will go through). Why would a woman need a C-Section? While 32% of women in the U.S. have a C-Section, the procedure is actually only medically necessary about 10-15% of the time (3). The rest of the cases are precipitated by “maternal request.” The American College of Obstetricians and Gynecologists strongly recommends that women be thoroughly educated so that they can make an informed choice about their delivery, as C-sections are major surgical procedures (as you saw if you watched the video above) with risks during the operation, as well as longer-term consequences (4). On this last point, an epidural (the injection administered to reduce feeling below the waist during labor in order to reduce pain) can sometimes slow the labor process because, once administered, the woman must remain on her back since she is numb (or almost numb) below her waist. Not being able to move and access various positions can sometimes slow the labor process. C-sections may also become necessary if the woman does not have the strength and stamina to push her baby out. Pushing is hard work, and that is why proper exercise during pregnancy can reduce a woman’s risk of requiring a C-section by 75% (6). What is post-surgical recovery like? After the procedure, most women will spend 3 nights in the hospital resting and recovering. Once discharged, women are usually advised to lift nothing more than the baby (or its equivalent in weight) and should primarily be resting for a few weeks to allow the incision to heal. Walking is recommended, because it helps minimize the likelihood of developing a blood clot and reduces constipation. Other than that, no standardized recovery protocol exists following this procedure. Compare this to the regimented post-op procedures for other major surgeries (like shoulder, knee, or hip) which include months of physical therapy and a standardized rehabilitation process. Not having a set post-op plan can make your job much more challenging, because you are left in the dark about how and where to start a client’s recovery process once she returns to training. We will help shed some light on this in part 2 — providing some simple strategies you can incorporate with your clients to begin their healing process.